The easiest way to get to Dai Nam Park is to take the #616 bus from Ben Thanh Market (616 bus schedule here). It takes about an hour and a half to reach the park (it’s the last stop). If you are closer to Mien Tay bus station, you can take the 618 bus all the way to the park. If you happen to miss the last bus back (around 5:20), you can walk to the highway and flag down a small bus that says Saigon on it. It will probably be going to Mien Dong station. After departing the bus at the park, walk towards the large gate where the historical zone is. 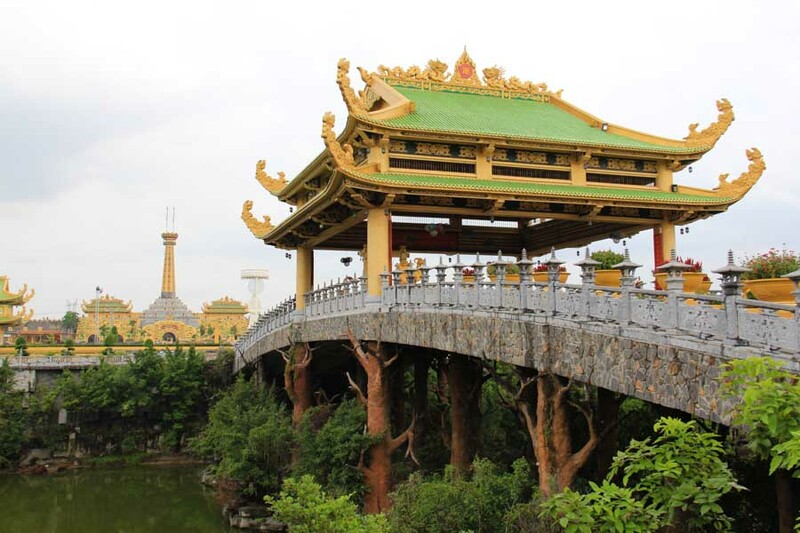 If you’ve been to Hue, you may recognize the vast surroundings. It’s a replica of the Imperial City. You could spend a half hour or more walking around and taking photos. A giant bridge that spans an artificial jungle and lake (complete with jungle sounds). To get to the next section, you can walk for 15 minutes, take the free shuttle that never seems to come, or rent a bicycle for a small fee. On the road, you’ll have to stop at the ticket booth and buy tickets. The price depend on what you want to do, but it’s all broken down here. The 5 Unicorn Labyrinth. Where you can see the repercussions of not being a good Buddhist. I skipped the rides on my first visit, but I did make a point to go to the 5 Unicorn Labyrinth, a Disney World’s It’s a Small World style ride that involves sitting in a boat and being taken through a strange concoction of lights and sounds. Perhaps it’s closer to this. It’s suppose to be about Buddhism, but it’s all in Vietnamese so don’t expect to learn anything. But do expect to be perplexed and frightened. Watch the video above to get a taste of it. The Dai Nam Park Zoo has quite a few animals. I’ve read that it’s more humane than other Vietnamese zoos, mainly because the enclosures are a decent size. I did however, see an elephant that was chained to a tree. Yes, his enclosure was large, but he could only use 20 square meters of it. Perhaps it’s because the elephant is a killer. Seriously. A few years back, a man who was painting the elephant enclosure was charged at and killed by an elephant. I’m not sure whether the pachyderm was put down, but I did hear that a tiger wasn’t sentenced to the death penalty after it committed the ultimate sin. In 2009, a tiger jumped the fence and attacked some workers. Two men were injured and one was killed. A local Vietnamese woman told me that they didn’t put the tiger down, but I don’t know for sure. Dai Nam Park boasts the largest artificial sea in Southeast Asia. The 20,000 square meter wave pool is quite big, and makes for a nice refreshing dip. There are plenty of place along the water that will offer you a seat, along with some food or drink. It’s easy to spend a whole day at Dai Nam Park. I was there for about 6 hours and I didn’t even browse the amusement park section. 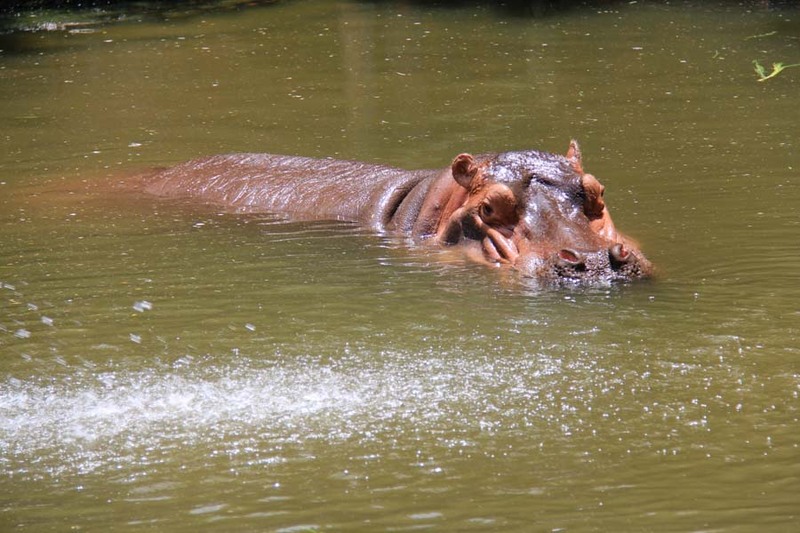 The zoo is worth a couple hours, and the water park is a wonderful place to have lunch. The food is cheap and delicious. There’s talks about expanding the park. The owner has bought up all the land around the area. The rumor is, he’s waiting for Vietnam to legalize gambling so he can put in a giant casino. I think that would add significantly to the amount of people visiting the park. Currently, the park is pretty empty on the weekdays, and a bit busy on the weekends. 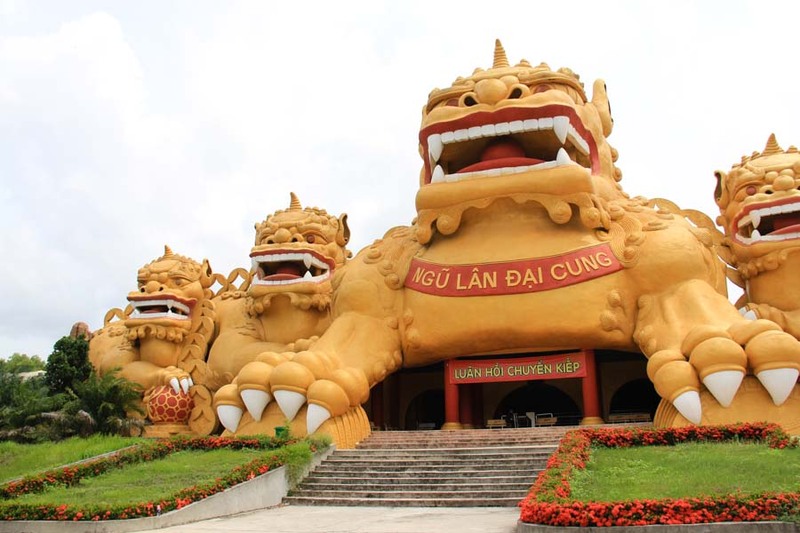 If you’re looking for a day trip from Ho Chi Minh City, try Dai Nam Park.